A few days ago, we saw what astronauts see when they reenter Earth's atmosphere in the Soyuz space capsule. 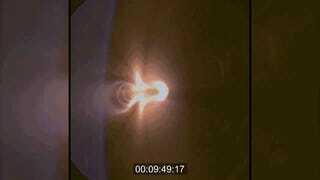 But that awesome array of sparks and glowing heat waves pales in comparison to new reentry footage recently taken from a camera on the Orion crew module. The video is incredible. An interior camera is pointed away from the Earth's surface at the plasma trail produced by the module as slams through the atmosphere at 20,000 miles per hour. The trail changes colors from white to yellow to pink to magenta to orange before fading out right before Orion fires its thrusters to orient itself and head towards its landing zone in the Pacific Ocean. You can see Earth's horizon swivel as this happens. The view turns from black to blue in a matter of seconds. Then come the parachutes and finally splashdown.